Members of Armed Police Battalion (APBN) on Thursday arrested two passengers of a domestic flight with 3,000 yaba tablets at Hazrat Shahjalal International Airport. The detained passengers are identified as Mamun Mallik, 31, son of Salam Mallik and M Jabul Sheikh, 30, son of Rob Sheikh, hailing from Shakharikathi area under Nazirpur upazila in Pirojpur district. 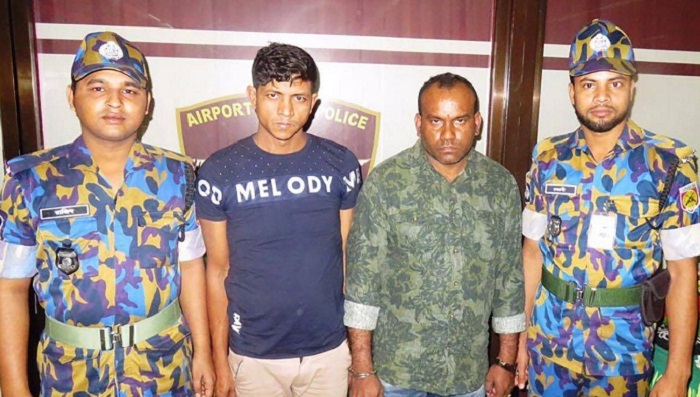 “They came to Dhaka from Cox’s Bazar by a NOVO Air flight around 11.50 am Based on secret information, APBN members arrested them from outside area of the domestic terminal,” said ASP of APBN M Alomgir Hossain Shimu. Later, they were handed over to the Airport Police Station with a case.